Heat transfers can liven up an outfit and transform an ordinary shirt into a memorable keepsake. Fear of ruining expensive transfers or garments, however, can make the process appear to be more dangerous and complicated than it really is. Cotton and cotton polyester blend fabrics are perfectly safe for heat transfers. To avoid potential damage to either your garment or transfer image, carefully read all precautions that come with the transfer and ensure that your garment is not 100 percent polyester. Plug your iron into an electric outlet and set it to the highest setting for cotton polyester blends. Allow your iron to preheat for no less than five minutes. If using a commercial press, heat to 375 Fahrenheit (190 Celsius) and skip to Step 3. 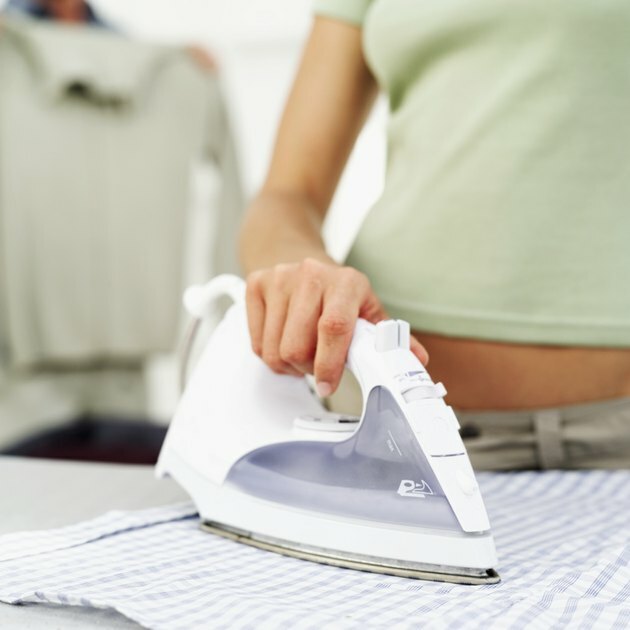 Lay a pillowcase on your ironing surface and iron out all wrinkles. Lay your garment on top of the smooth pillowcase and iron all the wrinkles out of it. Place the iron in the upright position. Fold the corner of the transfer paper and gently lift the paper backing off the transfer paper up to the image. Lay the backing over the transfer paper and trim the paper around the image with clean scissors. Carefully remove the paper backing completely from the transfer paper. Place the transfer paper face up on your garment and cover with parchment paper. Ensure that the transfer paper is appropriately aligned on your garment. If using a commercial press, press the garment with high pressure for no less than 15 seconds. If using a hand iron, make four 20-second passes from right to left over the entire transfer. Repeat the action from the bottom to the top of the transfer, taking care to heat all corners of the transfer. Allow the garment and transfer to cool at least two minutes. Gently peel the parchment off of your garment. Unplug the iron or turn off commercial press. Always exercise caution when using a hot iron or commercial press. Do not use steam settings when making a transfer.